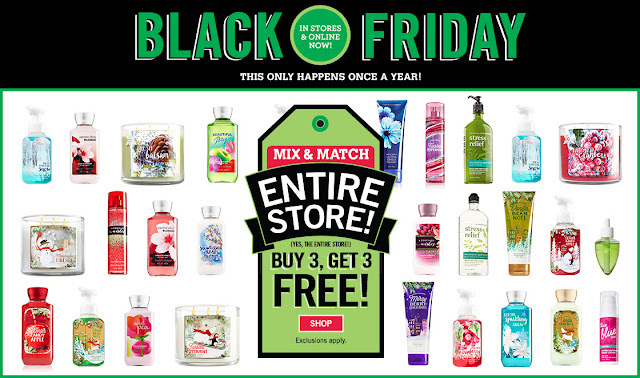 mommy's reviews: Bath & Body Works BUY 3 GET 3 FREE IS LIVE!!! Good Morning! Hope you all had a blessed Thanksgiving...can't believe we are gearing up for Christmas. Wow!! Anyway, today only, Bath & Body Works (one of my FAVORITE body care stores) is having a fantastic Black Friday sale and I wanted to share if anyone was interested. Today is their BUY 3 GET 3 FREE sale on EVERYTHING in the store. YAY!! So, if you still have shopping to do, make sure you check out Bath & Body works. Their candles are wonderful and so fragrant and their body washes are my favorites! Their products are pretty much what I love to use daily.